Wrap up your day with a drink at the poolside bar. Buffet breakfasts are available daily from 8 AM to 10:30 AM for a fee. At Antony's Complex, enjoy a satisfying meal at the restaurant. Quench your thirst with your favorite drink at the bar/lounge. Continental breakfasts are available daily from 8 AM to 10 AM for a fee. If you like to party then this is definitely for you. There is plenty to keep you entertained here and not just the pool parties but the bar is open 24 hours so you will never be without a chilling drink in hand, challenge your friends to a game of pool, darts, reach the next level with the video games or take part in the water sports just a stones throw away at the beach. The hotel consists of several blocks, all within 2 mn walk to the main building, which is on the beachfront. Some blocks have sea view, pool view, or garden views. At Akti Panela Beach Hotel, enjoy a satisfying meal at the restaurant. Wrap up your day with a drink at the bar/lounge. Buffet breakfasts are available daily from 8 AM to 10:30 AM for a fee. 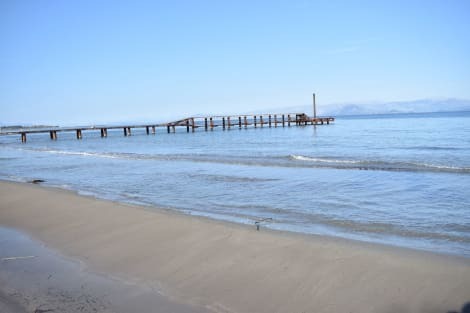 With a stay at Morfeas Hotel in Corfu, you'll be a 2-minute drive from Kavos Beach and 10 minutes from Lefkimmi Port. This hotel is 13.2 mi (21.3 km) from Issos Beach and 15.7 mi (25.2 km) from Port of Igoumenitsa. 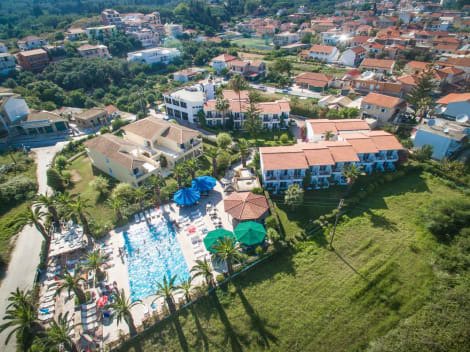 With a stay at Olympion Village in Corfu, you'll be a 2-minute drive from Kavos Beach and 7 minutes from Lefkimmi Port. 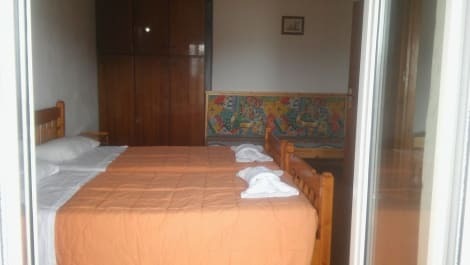 This family-friendly aparthotel is 12.7 mi (20.4 km) from Issos Beach and 15.1 mi (24.4 km) from Port of Igoumenitsa. Make yourself at home in one of the 10 air-conditioned rooms featuring kitchenettes with refrigerators and stovetops. Rooms have private furnished balconies. Enjoy international cuisine at Olive Grove Restaurant, a restaurant which features a bar, or stay in and take advantage of the room service (during limited hours). Quench your thirst with your favorite drink at the poolside bar. Cooked-to-order breakfasts are available for a fee. 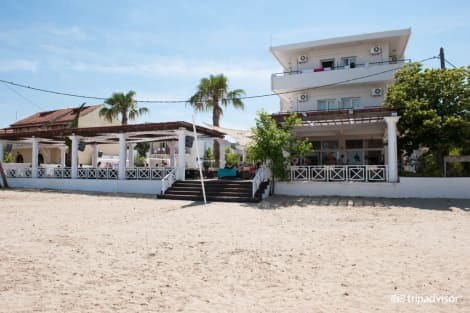 Kavos is a vibrant Greek seaside resort in the southeast of Corfu, popular for those wanting some sun, sand and great entertainment. Sit back and enjoy the wide expanse of beach that stretches for miles, before heading out for the evening to explore ‘the strip, where many bars, restaurants and nightclubs line the street. 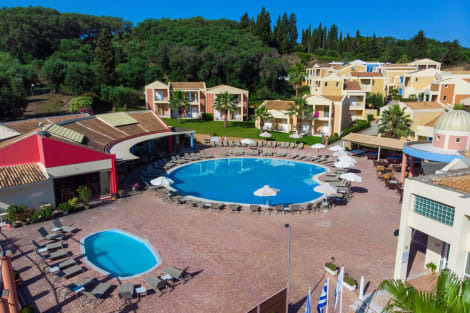 With excellent road connections and only thirty miles from Corfu Town and the airport, this is a lively holiday resort with plenty of options to explore further afield. Choose from one of the many Kavos hotels and join the 24-hour party. For adrenaline seekers, take an organised speedboat trip where you can snorkel in the crystal clear waters before enjoying a glass of bubbly in a secluded cove. Alternatively, try a Kavos Booze Cruise, which involves a day out at sea, a tasty Greek barbeque on the beach and plenty of fun, games and spray foam to be had. If chilling on a sunbed's not a priority, there's a plentiful supply of water sports nearby, including water skiing, snorkelling, parasailing, jet skiing and tubing. At night, unleash your singing voice at Maria's Famous Karaoke Fun Pub before heading to one of the many clubs to dance until dawn. Learn more about the history of Corfu by taking a trip to Corfu Town. The old part of the Capital is teaming with charming cobbled streets and alleyways, with many historic sites to be had along the way. Look out for the 10th century Old Fortress known as the Palaio Frourio and the New Fortress, the Neo Frourio, which had its part to play in World War II when it sheltered the islands population from attack. Visit the Church of Agios Spiridon, a place of pilgrimage for Orthodox Christians or wander around the Museum of Asian Art. For those who fancy a quiet afternoon in the tree lined hills, witness some spectacular scenery, by visiting Cape Aspro. Hire a car and climb Mount Pantokrator, which can be found north of Corfu Town and take in the magnificent panoramic view. For a more challenging hike, consider the Corfu Trail, which starts from Cape Agia Ekaterini on the north coast and ends in the southern village of Spartera; in all, about 220 km.